AnyChart has licensed out AnyStock — the best web component for time-based and financial data visualization — to Bitcoin2 project, thus becoming its technology sponsor. Bitcoin is an open source peer-to-peer network created in 2009 by Satoshi Nakamoto (whose real identity is unknown). It tracks and verifies transactions in bitcoins — a digital currency which is generated by Bitcoin software. When the program is run, users’ computers are constantly trying to solve cryptographic puzzles to get bitcoins as a reward. As more coins are generated, the puzzles get harder, and the reward goes down, which makes Bitcoin a deflationary currency. Bitcoins can be converted to and from other currencies, primary by online exchange services. In August 2011, there were over 7.1 million bitcoins in existence. Currently, a new version of the Bitcoin algorithm is developed – Bitcoin2. Its aim is to raise bitcoins’ liquidity by making transactions safer, creating a congenial investment climate for financial companies, and providing person identification tools so that the system could be used within the international legal framework. Bitcoin’s ideology is close to crypto-anarchism that expounds the use of strong public-key cryptography to bring about privacy and freedom. Bitcoin2 Project — a new generation of virtual currency for B2B and B2C. AnyStock — Stock and Financial Flash Charting Component. Today we are glad to present you a detailed case study: Building a Large Chart Ecosystem with AnyChart and Native XML Databases by Dan McCreary. Dan McCreary is an enterprise metadata strategy architect who has worked in the technology field for over 17 years. His career has taken him through the fields of solid state physics, computer chip design, supercomputing, working with Steve Jobs and NeXT Computer, and founding his own consulting firm — Integrity Solutions, which is now part of the WAM!NET Professional Services division. 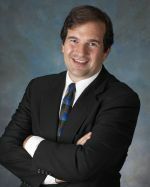 In the fall of 2000, Dan McCreary in collaboration with several other technology and marketing professionals formed Dan McCreary and Associates — a technology strategy development consulting firm specializing in helping firms align their business and technology strategies by effectively managing their metadata. The AnyChart system, when used within a native XML database, is ideal for building and maintaining a very large number of charts that can be quickly managed by non-programmers. Central to the AnyChart product is the declarative nature of XML files and the focus on “what” should be displayed, but not “how” the charts are rendered. This allows the target platform to change from Flash to HTML5 (currently in Beta) without any changes by the chart authoring system. AnyChart’s domain specific language for chart specification can also be easily extended for business specific tasks. This approach has saved our customers tens of thousands of dollars building interactive dashboards as well as much higher quality and consistency of the final products. This document shows how functions such as validation, search, quality, consistency, extensibility, and agility can be easily maintained using standardized, cross-platform XQuery libraries. This is just one example of how NoSQL (not only SQL) systems are ideal for managing semi-structured data. There are many charting software packages that are designed to create a simple bar charts or line charts on the web. But most of these systems break down once you need to create multiple charts for multiple users in multiple business units and yet still retain consistency and quality across hundreds or even thousands of charts. Our experience is that AnyChart, when combined with native XML databases, can allow large complex charting systems to be easily maintained by non-programmers. By using AnyChart system and native XML databases, we have created a large complex ecosystem where even very large numbers of charts can be quickly and easily managed. The secret is to combine the declarative nature of AnyChart XML files with a native XML database that can easily query all the charts in use based on a variety of search parameters. This case study will show that when combined with a native XML database, AnyChart systems can be very easy to manage by non-programmers. We are glad to introduce a new success story – about AnyChart and Information Systems for Business (ISFB). ISFB is a company that develops various information system based on thin client technology, using Drupal as a platform. To plot interactive pie charts and stacked bars showing schools’ readiness in different aspects. To create charts matching the design of the site and clear for the general public. To make an easy updatable visualization so that new data about schools could be added on-the-fly. The component supports a vide variety of charts types and different interactivity options. Due to XML interface, it is easy to draw and update charts. XML data files can be created both manually and using server side scripts. AnyChart is a designer friendly component: it allows easy chart configuration, and provides a convenient way of setting colors for any elements of charts. We are glad to announce the release of AnyChart 6.0 containing an HTML5 (SVG based) version of our component. Our aim is to make the HTML5 version a complete substitution for the Flash version as well as to make the switch to HTML5 as easy as possible. Another thing that we see as a highest priority is the compatibility of our component with different browsers and platforms. HTML5 charts are configured exactly the same way as Flash ones – in XML. The names of API methods are the same. The HTML5 version is designed to work in all up-to-date versions of popular desktop browsers, such as Chrome, Safari, Firefox, Internet Explorer, and Opera. It is also compatible with popular browsers for the mobile platforms Android (2.2+) and iOS (iPhone, iPad, iPod Touch). Though we have fully integrated the HTML5 version with our documentation as well as with the redistributable package, HTML5 support is still in the beta phase. Not all chart types and not all features are available for the moment, and we do not yet guarantee that all your charts in SVG version will look and work exactly like they do in Flash version. However, we are going to cover all Flash version features by the HTML5 engine by the end of the year, and you will be able to upgrade your charts without any significant changes in your web sites and applications. You can see how our HTML5 engine works in the examples from the Documentation and Gallery sections – just select an HTML5 tab when you view a chart. In case the features required to display a certain sample are not ready yet, you will see a relevant message. To review an instruction on implementation, see HTML5 Migration Guide tutorial. We are working hard to make the HTML5 version work exactly like the Flash version, and AnyChart will be updated each 1 or 2 weeks this fall. Check our web site or subscribe to our blog RSS or Twitter to be always aware of the latest changes. 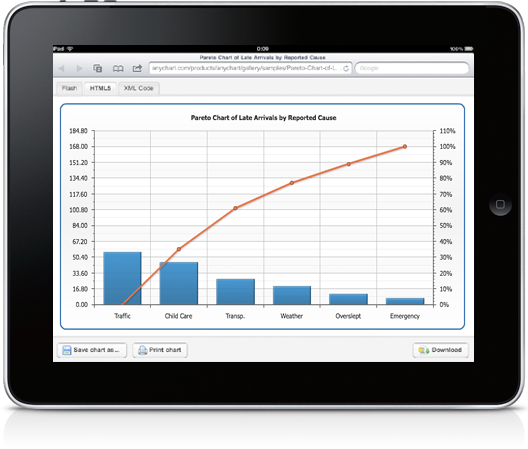 Thank you once again for the interest in AnyChart – Modern Data Visualization Solution.